Need immediate and constant daily hits to your site to make it look busy for the purpose of flipping, improving Alexa, ad selling, CPM advertising, PTP, etc? Here's your simple solution!! I will enter your site in my account at the Hitleap traffic exchange at a rate of 500+ automatic surf hits every day to your url for a total of 17000 to 18000 hits EVERY month!! Order the subscription and just set it and forget it! - Trackable in GoogleAnalytics and most 3rd party trackers you prefer. - Your website MUST be TE (traffic exchange) friendly with no Adfly or similar piggybacking ad services. - No adult sites or popups allowed. - NO sales or signups should be expected!! This service is used for the purposes stated in the 1st paragraph. Do NOT order if using for any other purpose!!! *Check the terms of your ad network if you plan to earn with CPM ads, as not all will accept TE traffic. *** As a FREE bonus, I will include a code you can add to the header of your site to hide the Hitleap traffic exchange as your visitor referrer, so you can make it look like the visits are coming from any site you prefer, such as Google, Facebook, Twitter, etc. This is useful when selling advertising or using affiliate programs. Need more hits? See the extras below! 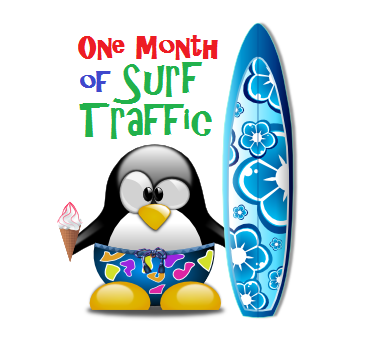 Monthly Traffic Exchange Hits Plus Free Bonus is ranked 5 out of 5. Based on 6 user reviews.